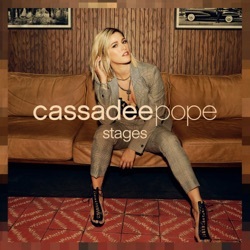 Stages is the second studio album by Cassadee Pope, released by Awake Music on February 1, 2019. This album is an emotional rollercoaster, taking us on a complete journey in every way. Emotional, catchy and deeply personal, Stages is a beautiful record. Even though Cassadee Pope’s new album, Stages, is her first full-length in over five years, the country-pop singer hasn’t missed a beat. So good Such a beautiful voice and 3 great singles. Can’t wait to see her open up on this album! It’s been a long time coming but totally worth the wait! Amazing Album I don’t normally write reviews, but after listening to the album I just had to! Cassadee Pope has outdone herself! This is the best I have ever heard her and cannot wait to see where 2019 takes her! So good. It’s honestly so pure and so real. Great job. Great! We went to the album release party tonight. There are so many hits on this album! Amazing!